Eyup Sultan Mosque: It is the first mosque constructed in Istanbul after conquer. It is constructed on 1458 by Fatih Sultan Mehmet, together with mausoleum. Today's mosque is the mosque constructed under supervision of Huseyin Efendi with demolishing the former mosque until to its base on 1800. Eyup Sultan Mausoleum: Halit Bin Zeyd (Hz. Eyup) the standard bearer of the Prophet Mohammed, and accepted the Islam first while he came to Mecca, is lying in the mausoleum, constructed on 1458. Eyup, during the seventh Arabic siege of the Istanbul, had participated to the war in the army leaded by one of the Emevi rulers Ebu Sufyan and martyred. Eyup's cemetery outside the ramparts is found by the teacher of Fatih, Aksemsettin after the conquer of Istanbul. Fatih, had constructed a mausoleum on this cemetery and a mosque near to it. Fatih Mosque: The Imperial Fatih Mosque, constructed between 1462 and 1470, bears the name of the Ottoman conqueror of Istanbul, Fatih Sultan Mehmet, and is the site of his mausoleum. Standing atop another of Istanbul's hills, its vast size and great complex of religious buildings - medreses, hospices, baths, a hospital, a caravanserai and a library make it well worth a visit. Suleymaniye Mosque and Kulliye: The cascading domes and four slender minarets of the Imperial Suleymaniye Mosque dominate the skyline on the Golden Horn's west bank. Considered the most beautiful of all imperial mosques in Istanbul, it was built between 1550 and 1557 by Sinan, the renowned architect of the Ottoman Empire's golden age. Erected on the crest of a hill, the building is conspicuous for its great size, emphasized by the four minarets that rise from each comer of the courtyard. Inside are the mihrab (prayer niche showing the direction to Mecca) and the mimber (pulpit) made of finely carved white marble and exquisite stained-glass windows coloring the incoming streams of light. It was in the gardens of this complex that Suleyman and his wife, Hurrem Sultan (Roxelane), had their mausolea built, and near here also Sinan built his own tomb. The mosque complex also includes four medreses, or theological schools, a school of medicine, a caravanserai, a Turkish bath, and a kitchen and hospice for the poor. Beyazit Mosque: It is at the square, which is mentioned with its name. This great mosque and its kulliye, (theology school, school, imaret, caravansary and hamam), is constructed by son of Fatih, II. Bayezit on 1501 - 1506. It has two minarets which are 87 meters away from each other. Plan of the Bayazit Mosque is similar to Hagia Sophia. But it is separated from it with especially a perfect architectural application which includes a different characteristic having worship order of a culture. Mimar Sinan Mausoleum: It is at the courtyard of Suleymaniye mosque. Head Architect Sinan (dec. 1588) is constructed this attractive, beautiful and simple outstanding mausoleum for himself. Structure, is reflecting the simplicity and elegancy, which complies with the geniusness of the master. Sultan Selim Mosque: It is around Edirnekapi, at Sultan Selim region. It is completed on 1522 during Kanuni Sultan Suleyman period. In the writing at main entrance, it is recorded that its construction is ordered by I. Selim, and according to some sources it is said that it is constructed by his son in the memory of his father. Haseki Mosque: Architect of this piece of art which is constructed on 1538 in the memory of Kanuni Sultan Suleyman's wife, Hurrem Sultan, is Sinan. There is an elegant kulliye composed of theology school, darussifa, imaret and public fountain, around it. It is widened on 1612 during I. Ahmet period. Yeni Mosque: It is at Eminonu. When mosque construction, which is started on 1597 by III. Mehmet's mother, Safiye Sultan, had reached to window level, ruler and his mother had died. Uncompleted construction is completed with the desire of IV. Mehmet's mother, Turhan Sultan on 1663. Sahzade Mosque: It is at Sarachane across the Minicipality Palace. Kanuni, ordered Mimar Sinan to construct a mosque in memory of his 1543 died son, Mehmet, and construction strated on 1544, had completed on 1548. Mosque, which is at the city center, is in the middle of a complex composed of theology schools, mausoleums, tabhane and imaret. Nuruosmaniye Mosque: It is at the Nuruosmaniye entrance of closed bazaar. Construction this mosque is commenced by I. Mahmut on 1748, and completed on 1755 during III. Osman due to his death. Rustempasa Mosque: It is constructed to Mimar Sinan on 1561 by one of the viziers of Kanuni, Rustem Pasa. As the place at Eminonu is both hollow and a commercial center, Sinan, had opened inns and shops under mosque. Sokullu Mehmet Pasa Mosque: It is at Kadirga. It is constructed to Mimar Sinan on 1671 by III. Selim's daughter, Esmehan Sultan, in memory of her husband, Vizier Mehmet Pasa. Inside of the mosque is adorned with the most beautiful tiles of the period till to the feet of the dome. Balcony cone is also tiled. Yeni Valide Mosque: It is at Uskudar. It is constructed as a kulliye by III. Ahmet's mother, Gulnuz Sultan on 1710. It has two minarets and double niches. Bezm-i Alem Valide Sultan (Dolmabahce) Mosqe: As it is understood from the inscription of Poet Ziver on the courtyard's door, Valide Sultan had started the construction of the mosque, and her son Abdulmecit had completed it on 1853. 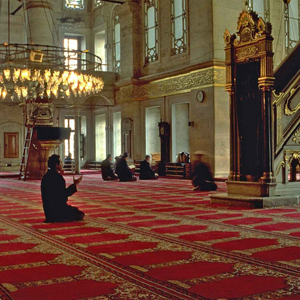 On 1848, its siege ramparts are removed and a naval museum is established within the mosque. Imrahor Ilyas Bey Mosque (Studios Monastery): It is constructed between Samatya and Yedikule on 463. The building, which is one of the former buildings of Istanbul, is devoted to baptist Yohannes. 13th century floor mosaics can be seen on the floor of the building.After the conquest of Istanbul, the structure was converted int o a mosque by Ilyas Bey in 1486. Afterwards the building had been exposed to various damages as a result of various earthquakes and fires, and in 1908 its roof collapsed and rendered any kind of restoration impossible;therefore the mosque still bares its destructed view. Former Imaret Mosque (Pantepoptes Monastery Church): It is on the slope, which descents from Fatih to Halic, and belongs to the beginning of II. century. It is constructed by I. Alexios's mother, Anna Dalaena. It is the most beautiful sample of period. Neve Salom Synagogue: The name of the synagogue means "Peace Oasis" and it is in Galata, on Buyuk Hendek Street. Neve Salom Synagogue serving the Shephardic Congregation opened on 25 March, 1951. It is designed and decorated in a modern style and it is the place of many major functions of the Jewish community such as weddings, Bar Mitzvah's (coming of age ceremony) and funerals. ( or the Appointment of the Chief Rabbinate (Hahambasilik Is'ad) ceremonies. Italian Synagogue: It is at Galata, on Poet Ziya Pasa Slope. This synagogue, which is especially Italian and Austrian nationality holding Hebrews, who live in Ottoman Empire, begin to serve on 1886. Askenazi Synagogue: This synagogue is among the other synagogues of Jewish people belonging to Askenaz community living in Istanbul and the only one that has still been in service. Loacted at Yuksek Kaldirim Street at Galata, the synagogue was constructed by Askenaz people of Austrian origin. With its facade in European style and the decoration of its Ehal and Teva( prayer desk) in wooden pagoda style with Polish influence,the synagogue displays a different view when compared to traditional Sefarad and Romaniot synagogues. Zulfaris Synagogue: Located at Galata quarter and have been present from the 17th century, the current building of the synagogue belongs to 19th century. The synagogue, in which religious ceremonies were carried out before the construction of Neve Salam Synagogue, have been not in service recently. However within the frame of the 1992 celebrations organization, the synagogue is determined to be converted into "500 Years Tranquil Life Musuem" without any effect on the religious appearance of the structure. Ahrida Synagogue: Located at Balat, the synagogue was built by those who had migrated to Macedonia from Ahri borough in 15thg century. Having a similar shape to a ship's bow, Teva( prayer desk) of the synagogue to some resembles to Noah's Ship while others compare it to Ottoman galleys that carried Sefarad immigrants to the Ottoman piers from Spain. Being in service over 500 years, the synagogue has been exposed to some fires and repaired . Moreover, embracing the most ancient appearance among the others included within frame of 500th annual celebratons programme, it was restored in Lale(Tulip) Period baroque style. Yanbol Synagogue: Located at Balat and built and named by the people migrating from Yanbolu borough in Macedonia, the synagogue is the second ancient Jewsih structure of the region. The paintings on the ceiling of the synagogue are though to be depicting Yanbolu Borough. Haydarpasa Hemdat Israel Synagogue: Located at a close distance to Haydarpasa Train Station,and derived its name from its story of foundation, the synagogue was put into service in Sept.3, 1989. That is the name "Hemdat Israel" which means "the mercy of the sons of Israel" was inspired from the arabic words "Hamid" and "Hemdat" written on the synagogue as the sign of gratitude for Abdulhamit II. who had surpassed the chaos let by those who were against the construction of the synagogue. Etz Ahayim Synagogue (Ortakoy): Becoming an appropriate residential for the Jewsih people who settled there after the great bedesten( bazaar) fire in 1618, Ortakoy where Jewish people already had lived from the ancient times, formed a model of harmony with three celestial religion performed in the mosque, synagogue and church located at a triangular area. Signifying the meaning of "Life Tree", Ortakoy Etz Ahayim Synagogue dated back to 17th century,which is derived from the documents of maintanance. The building was totally destructed in the fire of 1941 and today only the Ehal (case in which the manuscript parchments of the copy of the Pentateuch were kept) at the side of the garden of the building facing the sea have remained.